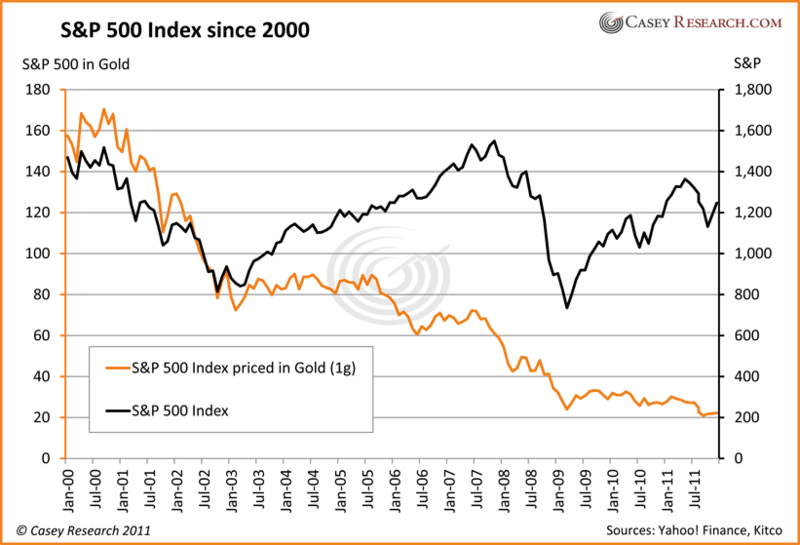 So says Jeff Clark (www.caseyresearch.com) in edited excerpts from his original article* entitled Start Thinking in Terms of Gold Price. Someday, we (or our heirs) are going to spend some of the wealth we are accumulating [but] how much we can actually buy with our gains will directly depend on how hard inflation has hit whatever our investments are denominated in. 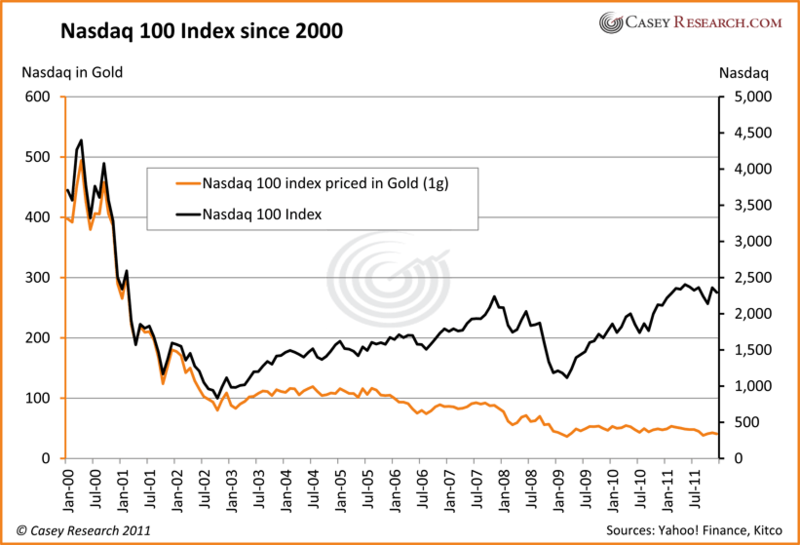 The only reliable way to measure the value of investments [in real terms, that is, adjusted for inflation,] is to [look at how well our investments would have done had they been denominated in gold instead of dollars. It is the only] way investors can tell how they’re [really] doing…and, since most people don’t adjust for inflation, their investments are not doing as well as they think. 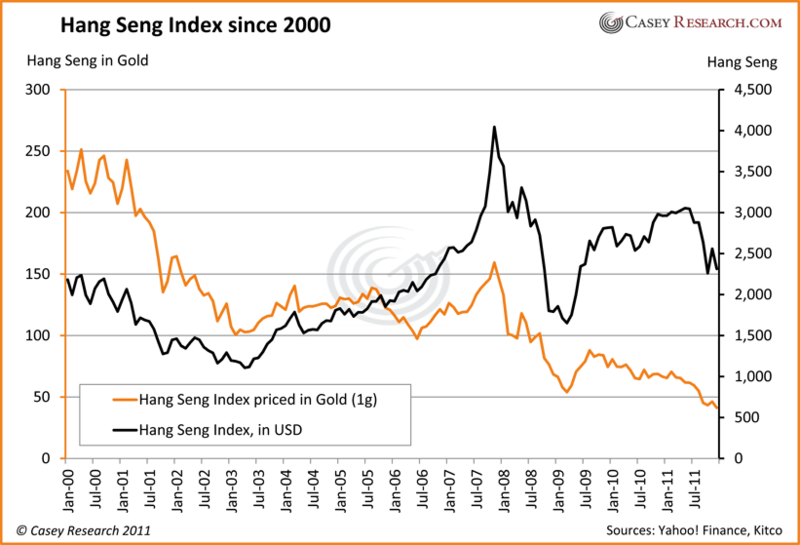 To demonstrate the effect of currency dilution, we’ve developed a tool for re-indexing popular indices from dollars to gold. Doing so provides a more accurate picture of the dilution of investments made in dollars (and would work just as well in euros or other currencies). We use gold in grams so the indices won’t be priced in decimals. While the Dow Jones Industrial Average is up 4.7% in dollar terms, it’s lost 82.5% when measured in gold grams. An investment of $10,000 on January 1, 2000 would total just $10,470 today (excluding dividends) – but in gold it’s worth only $1,750. 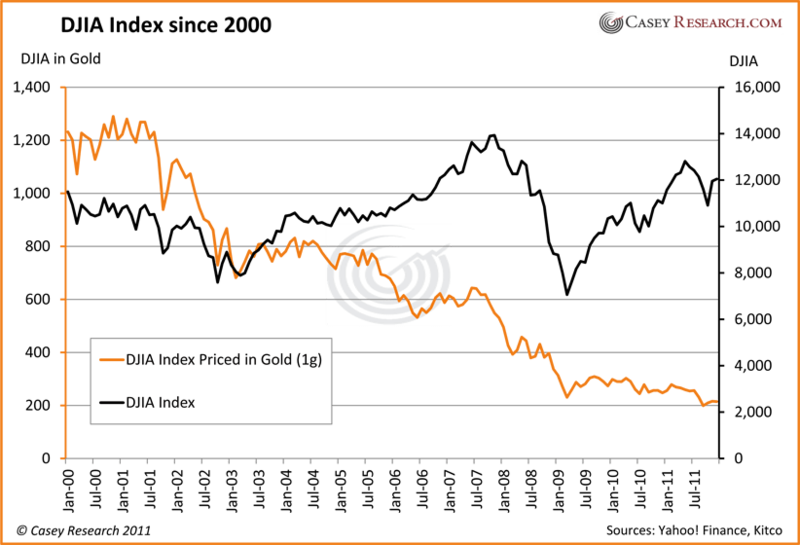 In other words, investments made in the DJIA Index have not only lost money in real terms, they’re worth a pittance when measured in gold. This is a breathtaking loss. 2. S&P 500 Down 85.8%! The S&P 500 is down 15.1% in dollars since 2000, but it’s lost 85.8% against gold. If you’ve owned an S&P index fund, you not only have fewer dollars that what you started with (excluding dividends) but have fallen dramatically behind when compared to the monetary asset of gold. 3. Nasdaq 100 Down 89.7%! Tech stocks show a whopping decline of 38% in dollars over the same time period, but money invested in that sector has lost 89.7% when measured in gold grams. 4. Hang Seng Down 82.3%! The stock market for Hong Kong, one of the largest exchanges in Asia, shows an increase of 6% in dollars. However, it’s lost 82.3% when priced in gold. The primary stock market for U.K. companies is down 22.4% since 2000 calculated in dollars, but has fallen 87.1% in gold grams. not rely on stocks in general to outpace inflation. Someday we’ll want to spend the gains we’re making [so] how…[can] we avoid the long-term erosion of the currencies we invest in? The answer is simple: save in gold. The dollars you keep in a money-market account will steadily lose value year after year. In fact, monies deposited into a simple savings account in 2000 have lost an incredible 25% of their purchasing power since then. Conversely, if those savings were denominated in gold, the wealth would have not only been preserved but increased. We believe this trend will continue – and accelerate. It will become increasingly important to your financial future that you cash in earnings from time to time and save them in precious metals – not in dollars, euros, yen, yuan, or even Swiss francs. Save in gold. That new car or retirement home or world travel you want to spend money on someday will be a lot easier to afford if your savings are denominated in the one asset that can’t be debased, devalued or destroyed. 3. Any Way You Look At It – Inflation Is On The Rise! 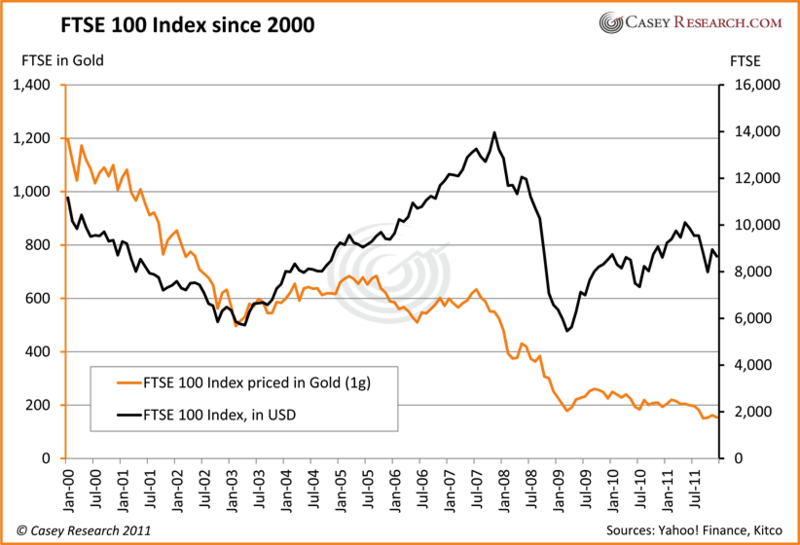 Previous Gold Bullion, Stocks or Bonds: Which Have More Long-term Investment Risk?